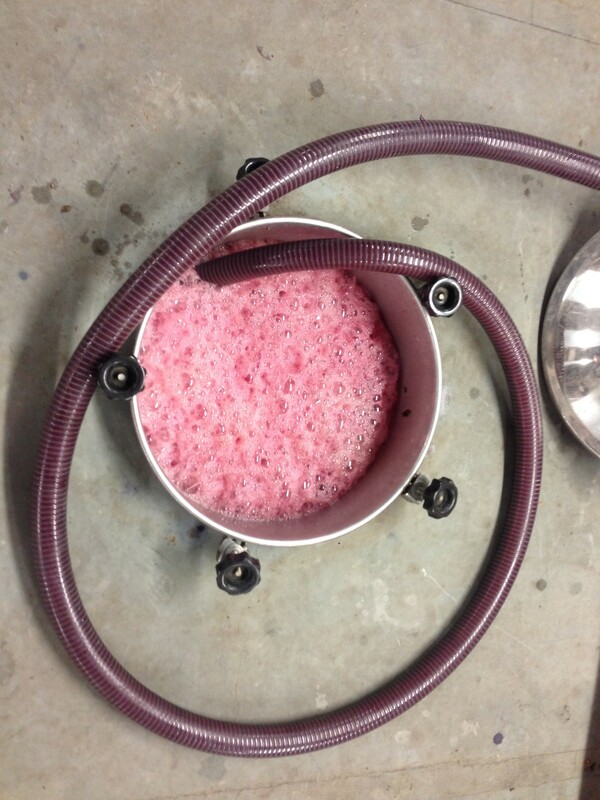 I think this one’s fermenting…. We started harvesting last Monday with the Syrah in Cru Vinsobres, these are now fermenting strongly and are over half way through their fermentations. On Wednesday we had another big day of harvesting, bringing in the grapes for the Carpe Diem Rosé, the Carpe Vinum fruity red and some of the cuves that will go into the Terra Firma Côtes du Rhône Villages (one of these is in the picture above). Having drawn off the juice for the Rosé immediately after harvest, we chilled it and left it to settle for two days. Yesterday we drew off the clear juices and blended the Syrah and Grenache juices to get the colour just right – the blend was 50/50, just like last year. Now it will have a very long slow fermentation at low temperature. In contrast the reds (like the one above) ferment at a higher temperature (although we still chill them a bit to control the temperature) and therefore, as you can see, they go a lot faster. We have had a little bit of rain this morning, the first for two weeks, but we should still be good to harvest the Cru Vinsobres Grenache on Tuesday, with the remainder probably towards the end of next week. Well done! Sounds like a successful harvest and the beginning of some great wine. You’re becoming masters of the craft! Thanks Marc – always lots to learn, but we are getting there!